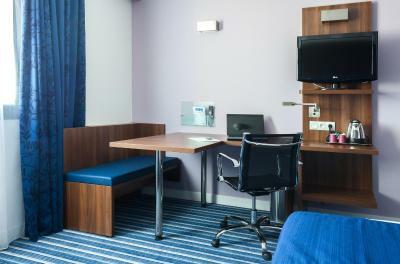 Lock in a great price for Holiday Inn Express Montpellier - Odysseum – rated 8.2 by recent guests! The person in the front desk who made the check inn was fabrastic and very good person. Thanks to him. I like breakfast. It had all the things you want for breakfast. 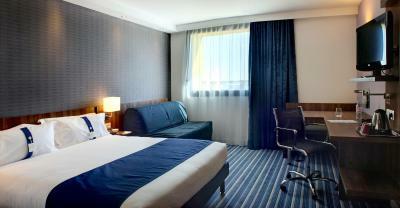 I chose the hotel because of its convenient location and because I had stayed here before. The rooms are quiet and the breakfast is good. Overall a very good experience. Good location if you are traveling by car. Not very close to city center, but you can easily reach it by tram (the tram stop is 4 minutes away). And the staff are super friendly and helpful. Added bonus: everyone loved the croissants at breakfast. We have used the hotel several times as a stop over, and will use it also in the future. New, fine location restaurants in the Odysseum area 5 min away. Very quiet in the rooms, ok breakfast, clean room. Closed Parking area (12€). Reception straff very friendly and english speaking, wifi working fine. 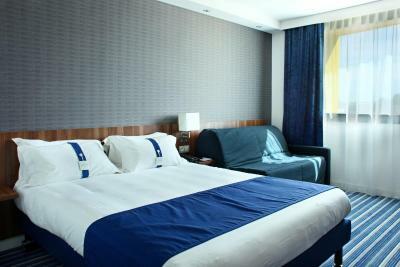 Comfortable room, helpful staff on reception who spoke good english. The staff were very friendly and extremely helpful. Breakfast was a bonus and quite substantial. The pool was also an added extra. The area was quiet and within walking distance to great restaurants and the tram. 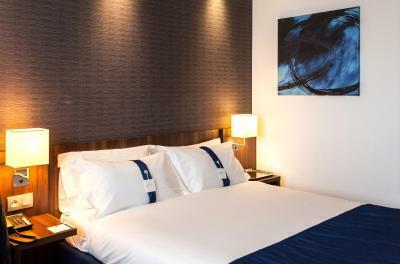 Located in the Odysseum district of Montpellier, this air-conditioned hotel features an outdoor swimming pool with a paddling area for children open during the summer months. Surrounded by a Mediterranean garden, it is a 5-minute drive from Montpellier Sud de France TGV Train Station and a 12-minute drive from Montpellier Airport. 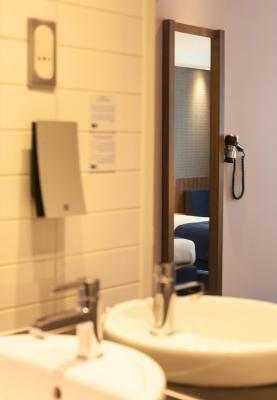 A private bathroom with shower, free WiFi and a flat-screen TV with satellite channels feature in the rooms. All include tea and coffee making facilities, and some are equipped with a kitchenette. A buffet breakfast is served every morning at Holiday Inn Express Montpellier – Odysseum and you can enjoy drinks and snacks from the bar. For evening meals, you can choose one of the 14 restaurants nearby. With limited, paid private parking on site, the hotel is opposite Planet Ocean Aquarium. The A709 motorway is only 3 minutes away and Place de France tram stop provides access to Montpellier Train Station, 2.5 mi away. 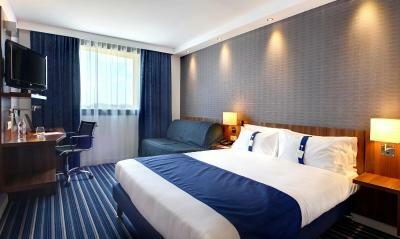 When would you like to stay at Holiday Inn Express Montpellier - Odysseum? Air-conditioned room with private bathroom and facilities for making hot drinks. 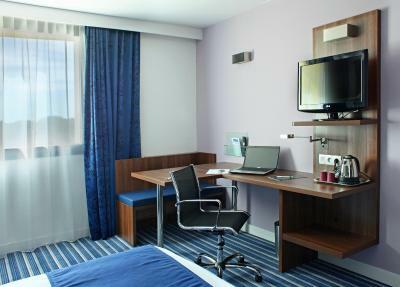 An LCD TV and free Wi-Fi are provided. No extra bed or cribs are possible in this room. Air-conditioned room suitable for disabled guests. 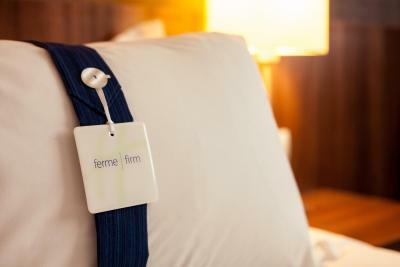 It features a private bathroom, an LCD TV and free Wi-Fi. Air-conditioned room with private bathroom and kitchenette. An LCD TV and free Wi-Fi are provided. If you want to use the sofa bed, please leave a message in the Special Requests box. 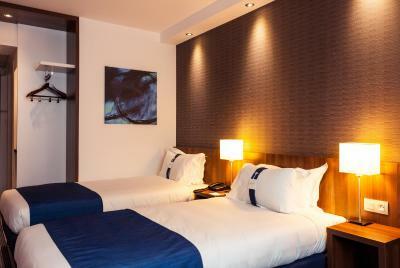 The room is suitable for 2 adults and 2 children or babies. This air-conditioned room features a flat-screen TV with cable channels and a private bathroom with a shower and a hairdryer. It is suitable for 2 adults and 2 children or babies. The perfect location to enjoy Montpellier for your business and leisure trips ! 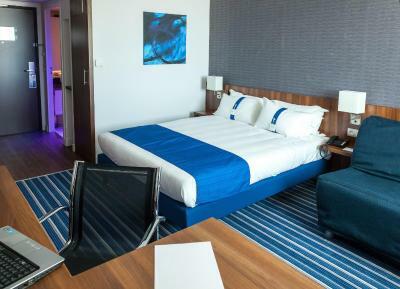 House Rules Holiday Inn Express Montpellier - Odysseum takes special requests – add in the next step! Holiday Inn Express Montpellier - Odysseum accepts these cards and reserves the right to temporarily hold an amount prior to arrival. Please note that checks and Checks Vacances Holiday Vouchers are not accepted methods of payment. Courtesy of staff can be improved. Someone stay long minutes near you without asking about your needs. There was miscommunication in the hotel regarding our parking reservation and there was no parking. In the end we parked on the street. There were plenty of spaces to park for free. Just next to the Aquarium. Very helpful staff. Apart from the croissants that were super, the rest of the breakfast was simply OK.
No fridge, safe nor wardrobe as such. Quite cramped. Nice reception staff. Breakfast was good. Within walking distance of restaurants, shopping centre and tram line. Free parking on the road. Windows should be cleaned - have been there on several occasions and windows have always been dirty. Shame. Yes. The bed was great. Good Bed and good breakfast, nice staff. Mix up of the room and keys at first but sorted real fast by reception. Nothing bad really. I was asked if I wanted to pay up front, I said no I'd pay when I check out in case business plans change. I was still charged at check in for some reason. When plans did change I notified ahead of the required one day notice. I was not refunded the difference. Management was involved and they were not flexible. Not returning.